Today’s card is HeruWer (Horus the Elder) represented by the winged falcon holding the shen in its talons and a sun disc over his head. This deity, like Merlin in the Celtic tradition, is the respected elder. In Ancient times, elders were respected for their wisdom and experience. These same elders were advisors to pharaoh in peace and in war. 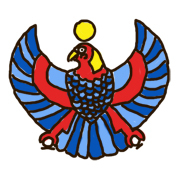 HeruWer’s emblem was worn by pharaoh into battle, where wisdom is the source of strategy and overcoming all enemies. HeruWer asks you to be thankful for the elders in your life. Recognize experience and wisdom as the gems that they are. And know, if you are not an elder already, that your experience and wisdom can teach others and is needed.